I honestly don't know where to start... Rick and the Horrify Me team take all my twisted fantasies and bring them into vivid, technicolor, full gore reality! I never thought I'd be brave enough for the Dark Boudoir but I felt so comfortable and the images are breathtaking. A full 5 out of 5 skulls for Rick - The Grand High Poo-Bah of Horror Photography! Oh where do I begin..... I have admired Horrify Me and Rick's work for months and finally decided to book a shoot. I chose a zombie shoot as they are my favourite horror characters. I've wanted to do one of these zombie shoots for months and it's so worth it, as the pictures are just incredible and you would not believe it's me at all. I was completely blown away by the pictures when I saw them. Rick and Claire made me feel so comfortable and relaxed throughout the shoot and were so welcoming too, and he has a great passion for the horror themes and for creating such amazing photos too! And for someone who has not a lot of confidence this has definitely boosted it..... Eveyone who has seen the images has said just how amazing they are! And it's also so much fun as well, and very messy but absolutely loved evey second of it! So all I'm going to say is get booked in on one of these shoots if you can! I'm defo going to book another shoot this year! I had the absolute pleasure of working with Rick and his wife Claire for our Baby Firefly inspired shoot. Both Rick and Claire made me feel completely welcome and at ease, guiding me and collaborating with me on exciting ideas. I really felt we bounced off each other and produced some truly amazing photos, it was the messiest shoot I have ever done but equally the best fun I have ever had whilst modelling. Extremely professional and both lovely friendly people! It was so worth the wait to finally do this shoot with them, I can't wait to work with them again it was wicked! Absolutely Amazing! The Horrify Me team - Rick and Claire are super passionate about all they do. Everything, from the concept to the makeup, special effects and photography, you can't possibly ask for more amazing experience! I have been working professionally with photographers over 12 years both as a model and as a makeup artist so I know both sides of the scene. This was one of the best photoshoots I have ever done and trust me, I have done a lot! One of a kind! Book yourself with Horrify Me, you will love it too! Have you ever wondered what it would be like to be a zombie? Or a vampire? Or any other horror character? Well now is your chance with Horrify Me - the horror makeover and photoshoot experts. Based in Kent, Horrify Me is the product of the twisted and warped mind of photographer Rick Jones, who along with his wife Claire and assistant Kaytie, convert normal looking people into blood crazed creatures. The conversion process includes a full professional makeover using latex style applications, hand crafted effects, a lot of dirt and mud, and buckets of blood. We mean that literally - there are buckets of blood! The blood itself is fully edible and as such can be applied just about anywhere. It's like a thick edible syrup that stays fluid and sticky throughout the whole photo shoot. So when Rick asks you to take a mouthful and just let it all dribble out as you snarl - it goes everywhere. By the end of the shoot, there was a whole pool of blood left on the floor with bloody footprints trailing from it. If the police were ever to visit this studio, they would seriously wonder what has been going on! The process from beginning to end is great fun - despite his obviously twisted mind and love of horror, Rick is surprisingly humble and polite and makes everyone feel completely at home while he focuses on the attention to detail in the makeover. Conversation was light and relaxed as we talked about all aspects of the process, horror movies and more. Every now and then the mood is brought down to earth with the offer of a welcome mug of tea. Once made up, and dripping with blood, it was time to start the photoshoot itself and as you can see from the photos - Rick really has a knack for capturing some truly terrifying images. 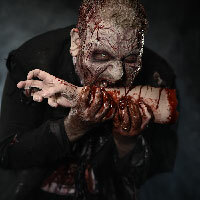 His direction and friendly manner throughout help get the best out of you - even for people struggling to unleash their inner zombie! Each session includes a number of different poses and Rick is happy to work with any scenes or concepts that you may suggest. The shoot itself is fun and the tone is light-hearted despite the graphic nature of the poses. All too soon, we were finished and then started the unenviable job or getting out of the blood soaked clothes. My main costume went straight in the bin, but I decided that it would be fun to drive home will the full zombie face intact. Probably not the best idea as the syrupy blood was still not dried and when I stopped at the services for a rest stop, I got some VERY strange looks from passers by! So if you have a love of horror and want some amazing pictures of yourself then check out their website and book as session. You'll have so much fun doing it and will have a set of pictures to treasure forever! So friendly and professional. Genuinely a great experience, would highly recommend and hope to visit again in the future! What can I say about Rick that has not already been said? The man is a genius!!! I have admired Horrify Me's work for bloody ages, I really love horror themed shoots and Rick does them so well that I just had to contact him regarding a theme I have wanted to do since I first started modeling. I was thrilled when he said yes and we set a date. Pre-shoot coms and planning was spot on. Rick was happy to take on any ideas and suggestions I had but also had some great input of his own. On the day of the shoot I sat for 6 hours for my make up to be done, Rick made me feel very at ease and talked me through the process of the SFX which I found amazing!!! His wife Claire was also amazing, keeping me warm and plying with me tea ( the lady is a god send ). Together Rick and Claire make the most amazing team, they made me feel very relaxed and welcome and the whole shoot was such a lot of fun. I've already seen a sneak preview of the shoot ( the very next day ) and I can honestly say it was so worth it, and I would totally shoot with them again. I would HIGHLY recommend working with them, you won't be disappointed. I understand that chaperones also so very welcome. Thank you so much Rick and Claire, for your kindness, patience and the dream.